Totius Regni Galliae Sive Franciae et Navarrae novi¯ima Tabula edita Ó Io. Bapt. Homann Norimbergae - Homann, J.B. Title : Totius Regni Galliae Sive Franciae et Navarrae novi¯ima Tabula edita Ó Io. Bapt. Homann Norimbergae. Map maker : Homann, J.B.. Size : 19.2 x 22.4 inches. / 48.8 x 57.0 cm. 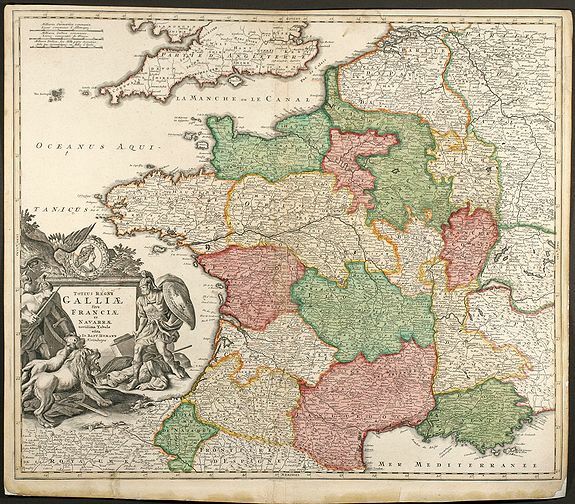 Description :Copper engraved map of France by J. B. Homann. Covering complete France and southern part of the British Isles with many detail and one beautiful dramatic cartouche. Condition : Centerfold split and margin backed, two small tears in lower margin backed.